Some 1,055 athletes, representing 9.6% of all athletes participating in the Games of the XXIX Olympiad in Beijing, had to be treated for an injury. This is the overall outcome of a study carried out for the first time by the IOC during the Olympic Games based on data provided by physicians or physiotherapists responsible for 92 national teams.The Olympic Council of Ireland's medical team contributed Irish team data to the study. 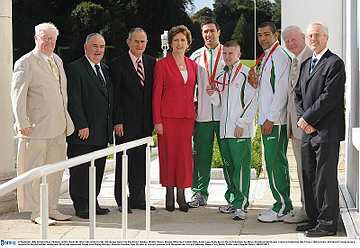 President Mary McAleese hosted a reception for the Irish Olympic Team on Saturday 21st September at Aras an Uachtarain, and praised the efforts of the athletes, support staff and the Olympic Council of Ireland. For information, guests who attended can access photographs from the following website: Maxwell Photography.ie. 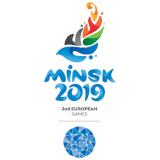 Ireland's Olympic Team finished 33rd out of 49 European Nations at the Beijing Olympic Games.Ireland's medals were won in a single sport whilst other Nations had a spread of medals across focused sports. 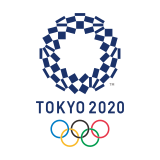 The Olympic Council of Ireland will complete the 2008 Olympic cycle in October (9th -17th) with a thorough debrief with each of the 12 National Federations who qualified athletes for the Games. 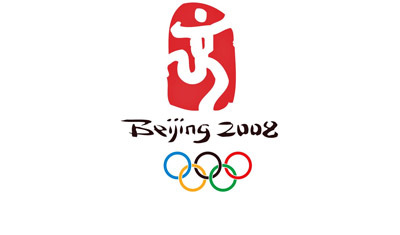 The Olympic Council of Ireland and the Irish Olympic Team would like to thank sponsors and the Irish public for their support of the Olympic Team during the 2008 Beijing Games. One of the features of the 2008 Games from an Irish perspective has been the magnificent team spirit between athletes, team management and support staff. The Irish Olympic Team returned home to Dublin and were met by Minister of Sport Martin Cullen, President OCI, Pat Hickey and Government officials from the Department of Arts Sport and Tourism and Sports Council. The team were led off the plane by our three Olympic Medallists , Ken Egan, Darren Sutherland, and Paddy Barnes. 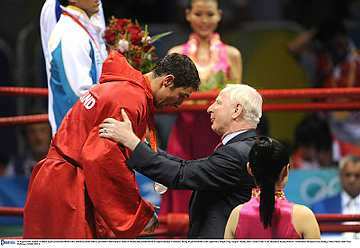 In his heart of hearts Kenny Egan believed he should be Olympic champion but there was no golden ending as he had to settle for silver when he was beaten 11-7 by China's Zhang Xiaoping at the Workers' Gymnasium. There were only two Irish competitors in action on the penultimate day of action in Beijing.In the men's mountain bike Irish champion Robin Seymour didn't finish the race, withdrawing after the second lap. At the Birds Nest Alistair Cragg couldn't finish the final of the 5000m because of injury. Chef de Mission, Dermot Henihan issued the following statement last night August 21st, at 8pm on the Showjumping Event in Hong Kong.